Spices, herbs, tinctures and essential oils have been used for millennia to season our food, heal our bodies and boost our spirits. In our Throwback Thursday (#TBT) series, we at re:iimmune will take you back in history to learn how these gifts from Mother Nature have been used. We’ll focus on their use through the ages and beneficial purposes in regard to nutrition, natural health and household care. Today we focus on wonderful Witch Hazel! Indigenous to North America, hamamelis or witch hazel has been prized for thousands of years for it’s astringent, anti-inflammatory and healing benefits. Native Americans boiled the bark and leaves to create an extract that was valued for its cooling and healing properties in treating swellings and inflammations. Early New England Puritans copied the idea and it’s use in America has been widespread after Dr. Charles Hawes found that steam distillation of the plant’s twigs was more effective. “Hawes Extract” came on the market in Essex, Connecticut in 1846. The process was further refined by Thomas Newton Dickinson, Sr. who began the commercial production of the product. Dickinson’s Witch Hazel is still on the market today. Because it’s naturally rich in tannins, which have a drying effect, witch hazel’s astringent powers have been found to be helpful in treating hemorrhoids, minor bleeding and skin irritation from insect bites and poison ivy. 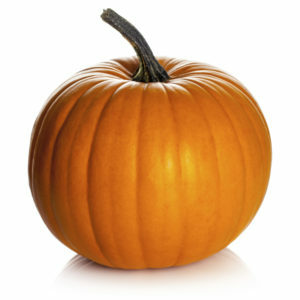 Some folks have also had success in using it to treat psoriasis and eczema. Because of it’s skin tightening properties, it’s also effective at slowing down and stopping bleeding from small cuts and scrapes. Witch Hazel is also prized by “Water Diviners” who practice an ancient technique called dowsing wherein a limb or branch of a tree is used to “divine” where water is located underground. They are also a great choice for landscaping as they are hardy, low maintenance and ignored by most pests. Whether you consider them a small tree or a large shrub, they are manageably sized, topping out at 10 to 20 feet. Some varieties will spread nearly as wide, making them a great addition when wanting to cover a lot of space in the yard. Best of all is the beautiful yellow glow you’ll see in your yard when its leaves turn in early autumn. Then in late fall, its spicy smelling, spidery shaped yellow flowers appear and will remain on the branches long after the leaves have fallen. 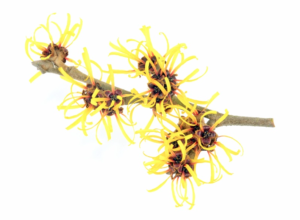 We can enjoy witch hazel’s beauty and also incorporate it into our own beauty routine! It’s commonly used as a toner and some folks claim that it helps to reduce puffiness and dark circles under the eyes. To test it out for yourself, mix equal parts witch hazel and aloe vera gel and pat under the eyes. We’ve included links to some other Do-It-Yourself beauty products that include witch hazel below. Enjoy! 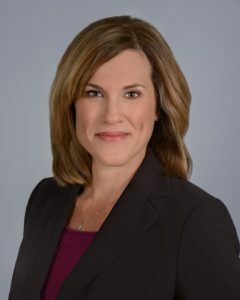 Last time, we talked about understanding the main culprits behind fall allergies and different ways to prevent them. Today we’ve got some suggestions of natural helpers to relieve your symptoms! Not only is it yummy but it also relieves symptoms of seasonal allergies as it contains the local pollen that is causing those allergies. Adding a couple of teaspoons into your day each day helps you to build up a tolerance. It’s a good idea to do this year round. Sweet and juicy relief! Pineapple contains the enzyme bromelain which helps to reduce swelling in the nose and sinuses. Well known for giving your immune system a boost, it also helps in breaking up mucus and supports lymphatic drainage. When you are feeling that runny nose coming on, try mixing one tablespoon each of Apple Cider Vinegar, fresh lemon juice and local honey mixed with water to get some relief. As we discussed in the last post, staying hydrated is one of the most important steps to take in preventing and relieving symptoms of fall allergies. You want to flush all that nastiness out of your system! Our isotonic Clinical Strength Hydration® formula also contains zinc, which helps adrenal fatigue caused by stress. Stress worsens the symptoms of both seasonal allergies and the common cold. Other supplements to add into your routine include Spirulina, Stinging Nettle and Quercetin, all of which help stop the release of histamines. Some folks find relief by using a combination of different essential oils. Remember that essential oils should typically not be applied directly to the skin. Instead, they should be added to a carrier oil such as jojoba, sweet almond or grapeseed oil to avoid irritation. Lavender, peppermint, lemon, eucalyptus and tea tree essential oils have strong antioxidant and anti-inflammatory qualities to aid in your allergy relief. One common way to get their benefits is by adding a few undiluted drops to your bath or shower to breathe in as you wash that pollen away! Check out essentialoilbenefits.com for more ideas and essential oil recipes. Suffering from fall allergies? 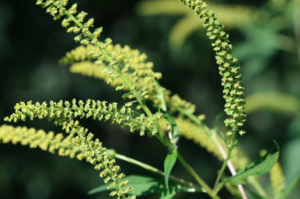 The main culprit of the seasonal sniffles is ragweed. We feel its wrath during the spring and then it typically begins to release its pollen during the warm days of August, lasting all the way into October. Because it can travel for hundreds of miles in the wind, even if it doesn’t grow where you live you may still be suffering the effects. Today we’ve got some ideas for you on how to prevent and deal with your fall allergies. If you do suffer from ragweed allergies, you should also minimize the following foods in your diet as they may exacerbate the symptoms: bananas, melon and zucchini. While we just sang the praises of chamomile in a recent post, those suffering from fall allergies may want to step away from the chamomile tea for a time too. Chamomile belongs to the same family of plants as ragweed. So as you might guess, it can also worsen your allergy symptoms. One of the best things you can do to ease and prevent fall allergies is to rid your home of dust and allergens as much as possible. While we all want to save a little money and turn the air conditioner off, open windows let that pollen you are trying to avoid into your home. So keep an eye on the allergy index/pollen count and on those days, you may want to consider keeping the windows closed. Also, many people use humidifiers to help with breathing, but dehumidifiers may actually be better if you are sensitive to dust or mold as both flourish in humidity. Don’t forget to clean up outside. Mold is another huge trigger for fall allergies and it flourishes in damp spots outdoors. 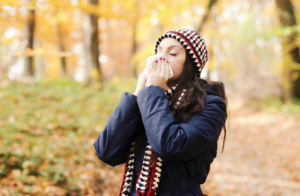 Take the time to clean up those rotting leaves and your sinuses will thank you. When you come back inside, leave those shoes at the door! Shoes track in pollen, dust and germs. Leaving them at the door and going shoeless in the house will help cut down on cleaning and protect you from illness and worsened allergies. You know we’re all about hydration! Staying hydrated helps keep your system in top shape and will help to decrease allergy symptoms of dry throat and a runny nose. Add some re:iimmune to that water and you’re body will receive hydration support and the benefits of prebiotics and probiotics. These keep gut flora in balance which helps make your system stronger against susceptibility to allergies. Many people also find relief in flushing their sinuses with a neti pot. Showering regularly will also help keep the pollen at bay and relieve symptoms. Tomorrow we’ll also share some other natural helpers in the battle against fall allergies, such as specific foods and essential oils. Check back in with us! Spices, herbs, tinctures and essential oils have been used for millennia to season our food, heal our bodies and boost our spirits. In our Throwback Thursday (#TBT) series, we at re:iimmune will take you back in history to learn how these gifts from Mother Nature have been used. We’ll focus on their use through the ages and beneficial purposes in regard to nutrition, natural health and household care. Ancient Egyptians believed chamomile to be a universal cure all and it certainly has a long history of being used to cure many ills and ailments. 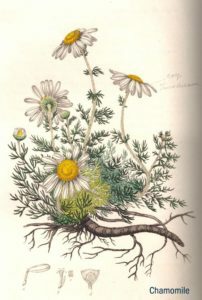 Both varieties of Chamomile, German and Roman, belong to the Astereraceae (daisy) family and are familiar to most people due to their popular use in teas to calm and soothe. It’s sometimes even called “the plant’s physician” as chamomile seems to help revive failing plants growing near it. In ancient Wales it was planted upon loved ones’ graves to bring about a happy afterlife. Here in this world, it has many beneficial uses! Chamomile has been used throughout history to calm upset stomachs, ease headaches, toothaches, teething babies, pink-eye, and to soothe sunburns. Chamomile oil is produced through steam distillation and during the process, a blue organic compound called azulene is produced. It is this compound, high in anti-inflammatory properties that makes it a good choice for alleviating the pains of arthritis and sore muscles and joints. Known for it’s power of soothing, it’s long been used in nighttime teas to promote a good and restful sleep. As with any herb, there are always precautions to think about. Too much chamomile can induce vomiting and some folks who are allergic to ragweed can have similar reactions. Also, it contains coumarin which is a natural blood thinner. So if you are already taking a blood thinner such as warfarin, you will want to check with your doctor. This pretty little herb also has a long history of being used in beauty products and treatments. It’s traditionally a go-to for calming inflammation in the skin such as eczema and acne and reducing puffiness around the eyes. Cosmetically speaking, it’s best known for bringing out highlights in blonde hair and for subtle lightening of darker tones. To do so, simply brew a strong cup of chamomile tea and let it cool. Apply to certain strands for highlights or do an overall rinse. Sit in the sunshine for about thirty minutes and then wash it out. Finally, chamomile is just one of the sweetest little flowers around! It’s fairly easy to grow, lovely to look at and a must have in the herb garden. While spring is typically the season when most people think of doing a big house cleaning, there are many important reasons to do the same in the fall. We’re all ready to cozy up and refresh our nests so that we can be comfortable, prepare for the holidays and keep healthy in the long winter ahead! Here are some things to keep in mind as you do your fall cleaning. . .
One of the biggest battles in a home is fighting against dust. Did you know that dust is comprised mostly of dead skin cells that we are constantly shedding? Getting rid of dust on furniture is something to do quite often to help with your breathing and allergies. Several times a year it’s a good idea to rid areas that aren’t often thought about. Bed pillows also collect dust, mold spores and other allergens. It’s best to clean your pillows three to four times a year and while we’ve got fall cleaning on the brain, it’s a perfect time to take care of them. Add a half cup of baking soda to your laundry detergent and if concerned about dust mites, eucalyptus oil is a great addition as well. To help keep your pillows fluffed up, put a couple of tennis balls into old socks and toss them in the dryer with the pillows. Don’t forget your walls, ceilings, curtains and overhead fans while doing your fall cleaning. It’s always a good idea to start high when cleaning and work your way down to the floor. 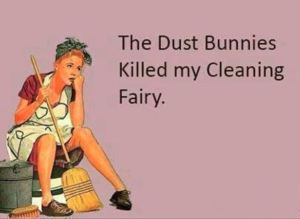 It’s no fun to get all the dust up out of corners and off of surfaces and then look up and realize you’re going to have to knock down all that dust up high onto those newly clean surfaces. After cleaning those high areas, wait a few minutes for the dust to settle before you continue cleaning anything else. It’s always fun to spend a few minutes daydreaming and watching the dust spores fall through the sunshine as they settle. Do you remember doing that as a kid? After daydreaming, it’s back to reality and it’s time to think about having the air ducts in your home cleaned by a professional. You yourself can change the air filter in your furnace to keep things running smoothly and to keep the air in your home clean and healthy. Fall is a great time to get rid of unnecessary clutter. Think about going through your closets and selecting clothing and coats for donation. The holidays are just around the corner so it’s also a good time to go through children’s toys and pare down before the gift deluge hits. Check out Treehugger.com. They have some great ideas for what to do with those expired spices, so don’t throw them out just yet! 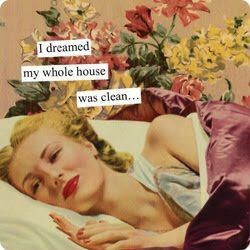 Very few of us really LOVE to clean but we love how the house feels when it’s all done! So put on your comfiest clothes and bliss out to your favorite tunes. Before you know it, you’ll have a cleaner and healthier home which will lift your spirits and make the next season much merrier and brighter. Check back next week when we’ll share some great natural ingredients for home cleaning!